The name goanna is a corruption of the Carib word iguana, here applied to a monitor lizard. While the largest of the monitors occur in Africa and Asia, and the Nile Monitor clearly has the largest geographical distribution, there are almost as many species in Australia as in the rest of the world combined. The loose articulation between the tip of the monitor’s lower jaws, as well as the solidly joined brain case and some other specializations, suggest to herpetologists that monitors may well be close to the sorts of animals that must have given rise to snakes. 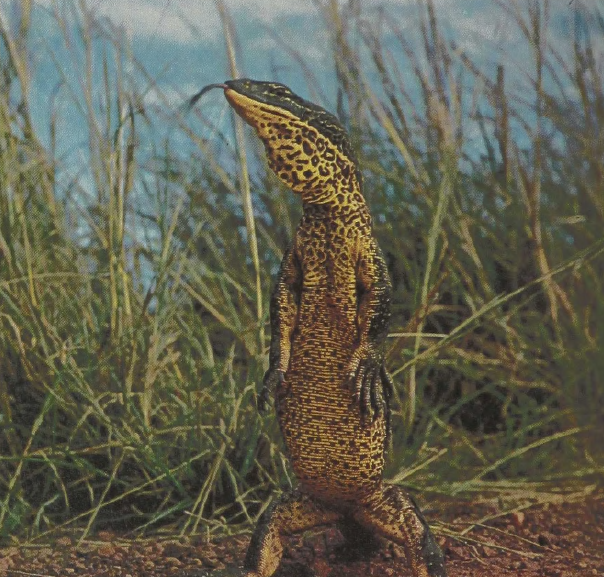 This becomes plausible when looking at such slender-headed Australian species as the Sand Goanna. While these species are clearly very long, they are relatively more slender than some of the Asiatic forms. What seems much more important is that they have a considerably longer and snake-like neck, which they pull into an S-shaped curve when they dart at prey.